With more than 80 million copies of his books in print across the world, any of Eric Carle’s books are a safe choice to read to children. 1 2 3 To The Zoo by Eric Carle is no exception. Although I have already read many different counting books to my baby, I like 1 2 3 To The Zoo the best by far. The main attraction of 1 2 3 To The Zoo is that there are no words. The entire book is simply filled with drawings of different quantities of animals on top of train cars. A colored number, which corresponds with the quantity of animals on the page, is located in the upper left corner of each page. On the final story page, all of the animals are drawn in their respective habitats at the zoo. If that were the extend of the book, 1 2 3 To The Zoo would still be a decent children’s counting book. By attaching a number to each type of animal and subsequently showing the animals in their zoo environment, Carle allows children to learn counting, animal names, and get excited about a trip to the zoo. 1 2 3 To The Zoo provides far more. On the bottom left corner of every page is a small drawing of the train. After each page, its contents (the animals) are added to the drawing of the train on the next page. Since the mini-drawings retain the color and visual outline of the larger illustrations, children can instantly recall every previous animal by looking at the train. As a fitting touch, the ending story page shows the empty train as all the animals have been deposited at the zoo. Carle also includes a “Where’s Waldo” type game for young children. Every page (except, oddly, the interior title page) includes a tiny mouse hidden somewhere amongst the larger picture. On same pages the brown mouse stands out and is instantly recognizable. On other pages–particularly with the bear and crocodile–the mouse is harder to find. Most adult readers won’t even notice the mouse the first time through the book. By the third time reading 1 2 3 To The Zoo, all readers will notice the way the other animals interact with the little mouse. 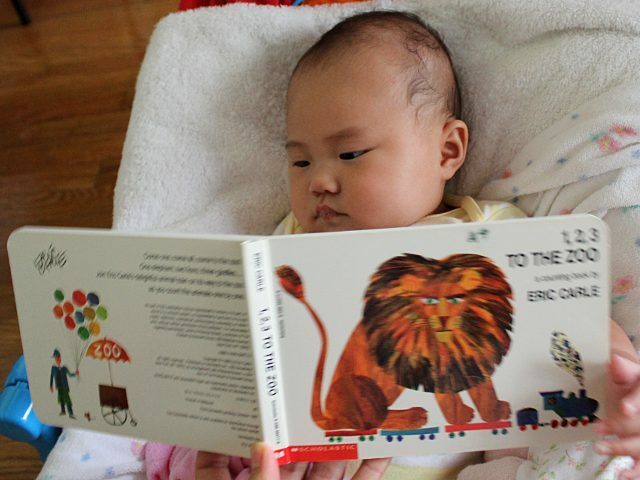 Children can also practice their colors throughout the story. The first and last pages are filled with repeated numbers from one to ten drawn in different colors. While these pages made me feel like I had synesthesia, Arya loved all the colors. As she gets older she will certainly learn to count while still being entertained by the array of bright colors. 1 2 3 To The Zoo is simply the best counting book for children. Even babies too young to learn how to count will like the pretty drawings. Children too old to need a counting book will enjoy re-reading the book before a trip to any major zoo. 1 2 3 To The Zoo costs (including shipping) $7.99 new and $3.99 used from Amazon.